Temporary Exhibition Space – is located on the top floor of the building and functions as an art gallery, a lecture space and a space for specific interest historical and cultural exhibitions. Over a twelve month period this space accommodates up to ten varying exhibitions which show the multiplicity of interests in County Cavan. 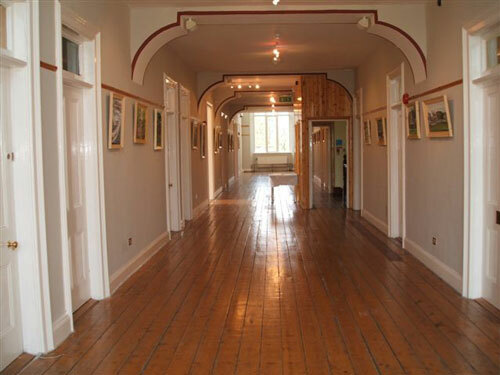 Exhibition Space – The Eden Gallery is located on the ground floor of the Museum and hosts many diverese exhibitions over a twelve month period. This gallery responds to public demand for historical arts and cultural events in order to best respond to the various interest of our clients. “Diversity” was the name given to 2008's Art, Craft and Design Exhibition at the Cavan County Museum in Ballyjamesduff. The show opened on the 17th of April at 8 p.m. and ran for two weeks. This exhibition was a collaboration between sixteen new artists then studying at Cavan Institute, presenting new and exciting work to the art world. Many different methods and styles were used, prompting a wide variety of art, through the medium of paint, print, sculpture and drawing, from the students. The Art, Craft and Design course in Cavan Institute is a one-year course which is primarily concerned with portfolio preparation for further art study. However the course also attracts a significant number of both mature students and recent school-leavers. Students also study modules in Communications and Image Processing. The course aims to encourage and develop student’s artistic abilities. The Art, Craft and Design class is small enough to provide plenty of tuition for each individual student and also to encourage experimentation with various materials and subject matter. Still-life, life drawing, sculpture and computer-aided design are all featured. An exciting travelling exhibition entitled “Seen But Not Heard – A Century Of Childhood In Ireland’, dealing with Irish childhood in the twentieth century was curated by a number of County Museums in Ireland, including Cavan County Museum. Commissioned by The Local Authority Museums Network and funded by The Heritage Council of Ireland, the exhibition toured the country during 2008 / 2009. In what was a major coup, the exhibition received its national launch at Cavan County Museum on 1 May 2008, when it was opened by Minister Brendan Smith. ‘Education’, ‘Health’, ‘Crime and Punishment’ and ‘Work and Play’ were just some of the many themes to be explored in this unique interactive exhibition. Schools, youth groups and adults all found something to interest them in this exhibition which ran until the end of June. The exhibition featured photographs, toys, audio recordings, clothing, school books and other artefacts associated with childhood during the twentieth century. This annual event was an opportunity to encourage people to try drawing and sketching in the beautiful and inspiring environment of the County Museum. Drawing is a universal language understood by everyone regardless of age, language or nationality. Participants tried out different ways of drawing which was both a learning experience and fun. The workshops w facilitated by artists Michelle Boyle and Riki Van den Berg. Edel Campbell Exhibition – opened Friday 13th June at 8 p.m. Simple line drawings are the starting point for much of Edel Campbell’s work. Using a combination of painting, drawing, sculpture and animation, her most recent body of work explores the notion of ‘transitional spaces’ - spaces that are either in a physical state of modification or those that become altered because of how we experience them. She is interested in how we read and engage with different kinds of spaces. How we inhabit, navigate and impose our inner world on them. How space, like language is another structure that can be used to express our sense of being in the world. In her drawings Edel allows the line to follow the contours of objects in space. Each intersection with another object poses a question of which route the line should take. The drawings become a trail, representing a series of decisions based on her observations. Edel Campbell studied Fine Art in NCAD, graduating in 1996 and recently completed a Masters in Multimedia systems in Trinity College. Edel is currently based in Red Stables Studios in Dublin.